Media Size: 5.50" x 4.25"
Custom design professional-looking note cards using your printer. 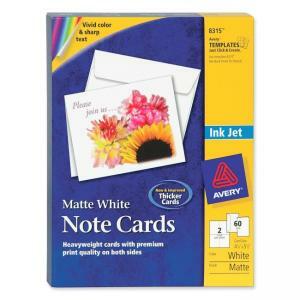 Ideal for creating Thank You Cards, announcements, invitations and more. Ultra-fine perforations allow you to separate cards easily and cleanly. Heavyweight cardstock sheets feed automatically from your printers paper tray. Note cards include coordinating envelopes. Avery offers many easy-to-use templates for Microsoft Word and other popular software programs.